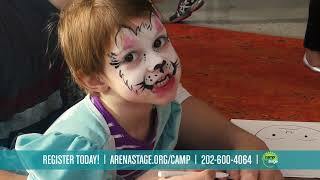 Camp Arena Stage is a multi-arts Summer day camp for artists ages 8-15. Celebrate 15 summers of art and community with Camp Arena Stage! Community and art make the magic of Camp Arena Stage. At camp we see, recognize and appreciate each individual for who they are and the art only they can make. We value being present, joyful, creative and kind. We know art has a product, but it is also a process full of mistakes and discoveries. We support one another and make a place that is safe to take risks and grow. Every day campers attend their set schedule of activities/classes. These activities are chosen before camp begins from more than 75 options in theater, dance, music, visual art, filmmaking and writing. Campers take the same five activities each day for the full camp session. Campers can choose activities within the same discipline or a variety of disciplines. It’s up to them! Camp Arena Stage provides a limited number of need-based scholarships each year for the 4-Week Intensive. Both full and partial scholarships are granted. The 2019 scholarship application deadline is March 18. Applications are now available. Camp Scholarships are supported by Friends of Southwest DC, Lavern Chatman/James I. Chatman Fund and the Robert and Natalie Mandel Family Foundation. Is Camp Arena Stage only a theater camp? Not at all! Camp Arena Stage is a multi-arts camp. We offer activities in visual arts, music, dance, media, writing and theater. You might only take theater activities or only visual arts activities or a mix of everything. That is up to you! You’ll have many exciting activities to choose from in creating your schedule. What do I do when I get to camp? The day begins in your small group. Your small group is like your homeroom — they will probably become some of your closest friends at camp. One counselor will be your group leader throughout the camp session, who will be a living home base just for you. This counselor will be there to check you in and take attendance in the morning, answer your questions throughout the day, and check in with you at the end of the day. There will also be a bin for you to drop off your well-marked lunch. Camp takes place in four nearby buildings, and the grounds outside them, on the Georgetown Visitation campus. Campers change activities at the same time, walking to their next activity. It is like changing classes in high school. On the first day of camp, we’ll all take a tour of the grounds. We clearly mark the activity rooms and make sure you know where you’re going. If you get lost – just ask any staff member. What if I don't like an activity? You were so sure in April that Digital Photo Essay was the thing to study, but now Clowning sounds really cool. Within reason and if class size allows, you can switch into a different Daily in the first three days. After that though, there you stay. We do our best to honor Daily choices, but we can’t always promise you’ll get every activity you wanted. While we won’t place you in a random activity, we might place you in your second or third choices. We want camp to be the best experience possible for you and are certain that it will be no matter what activities you take. Who knows? A Daily you were uncertain about might be your favorite one by the end of camp. My best friend is coming to Camp Arena Stage too. Can we have the exact same schedule? Yes! You can also be part of the same small group. Be sure both you and your friend note this request on your course selection form. If there is an activity that you really want to take regardless of whether your friend can get into it too, let us know that too. Keep in mind also that camp is a great opportunity to meet new people from different places. Who are those little kids? Who are those old kids? The age range at Camp Arena Stage is 8 to 15. Activities are usually grouped by ages 8-12 or 12-15. So you take activities with people close in age. Small groups are made up of campers entering the same grade. There will be many campers that are the same age as you and that’s who you will spend most of your time with. We make sure that the classes and activities are meant for each age – we do our best to make sure you do not feel too old or too young to be at camp. You will be challenged and you will also have fun. This is a big question that everyone has. Here’s the answer to what I really think you’re asking: You will like the people and they will like you. There will be people at camp your age. There will be both boys and girls. We will all be from different schools and neighborhoods in DC, Maryland and Virginia – even other parts of the world. Some people will have been at camp before and others will be new. The most important thing to us at Camp Arena Stage is community. You are going to spend your time at camp with people – adults and young people – that love the arts just as much as you do. That is the perfect foundation for a supportive, fun, creative, amazing community. Any staff member will be happy to help you. Really. Please don’t hesitate to ask. Don’t forget, you have a group leader who is looking out for you especially. Mostly we’ll eat outside. The campus has nice lawns, hills, gliders and patios where we can spread out. If it’s raining or beastly hot, we’ll eat inside. At the beginning, we eat in our small groups so people can get to know one another, but as camp goes on, you can eat with any of your friends. We will have camp as usual, but indoors. Please dress for the weather and/or bring an umbrella, as you will still have to walk outside to change activities. Will I have a chance to perform? Our daily Noontime Show is the big opportunity to perform. Dance, music and acting classes often perform and it is not unusual for writers or visual arts classes to share their work on stage. You can also sign up to present an act you’ve rehearsed at home or collaborate with friends at camp to create a performance. Your family and friends can come to the Noontime Show to watch you perform. No one will force you to get on stage, but we do encourage you to stretch yourself. You may surprise yourself and discover you enjoy being on stage. We think you’ll find camp is the perfect environment to take risks. We hear over and over again from campers that it is the most safe, supportive audience ever. Can I bring my i-pod, laptop, cell phone, etc.? Please don’t. They are easy to lose and distracting. An important part of art is being present and in the moment. Plugging yourself in, texting and all that keeps you from being fully present. Plus it can be rude. If you need to have a phone (because you take the bus for example), have your parents talk to us and we’ll work it out. Just like at school, we shouldn’t see personal electronics at all during the day. We’ve got other things to do. What if I am too old to be a camper? Camp Arena Stage employs a select group of rising high school juniors, seniors and recent graduates as counselors-in-training (CITs) and volunteers. CITs and volunteers undergo a full week of staff training and, during the camp session, assist in activities and serve as group leaders. Ideal candidates for these positions should be mature, responsible, energetic, and have arts interests and experience working with young people. Interested students should e-mail a letter of interest/introduction and résumé to camp@arenastage.org. Interviews are conducted in early Spring. No! Camp Arena Stage is a multi-arts camp. We offer activities in visual arts, music, dance, media, writing and theater. We have skilled faculty in each arts area to offer a wide range of quality, creative arts activities. What are the differences between sessions? Both sessions have the talented and caring staff, excellent arts instruction, commitment to camper choice and the spirit of Camp Arena Stage. The 4-Week Intensive has a few special features that we can offer because there is more time. In the 4-Week Intensive, campers go on a field trip and share their work in a final evening Arts Extravaganza. Scholarships are only available for the 4-Week Intensive. Campers are welcome to register for both sessions – and, because they choose their schedules, they can decide how similar those sessions will be. How do the activity schedules work? Each camper’s schedule is unique! So they do not travel to all of their activities with the same group of campers. Instead, we change classes at the same time and everyone goes their own way, like high school. The staff makes sure that everyone gets where they need to go. After the first few days everyone is a pro and the campers love the independence. In May, we email the list of activities and an activity request form to registered campers. Campers rate their top four choices in each activity period. Campers must choose activities for their age group unless special permission is given by the camp director. Exceptions are made at the camp director’s discretion. Activity request forms are due by June 1. At the end of May, we begin scheduling all campers who are paid in full and have returned all their paperwork (camper information, physician’s report, etc.). Our goal is to give as many campers as possible as many of their first choices as possible. We also take into account the class size set by the instructor, the age distribution of the campers who have selected the activity, and requests to have activities with friends. Schedules are not assigned on a first-returned, first-served basis. Can my child and his/her friend have the same schedule? Yes! Just note this when selecting activities. When does my child receive his/her schedule? All campers get their schedules at the same time on the first day of camp. What if my child wants to change his/her schedule? In the first three days of camp, they are welcome to change their schedule if space allows. This empowers campers to be decision makers. After three days, though, their schedule is final. This encourages discipline and dedication – both important qualities for art and life. Group leaders help campers change their schedules at camp beginning the second day. We encourage campers to change their schedule on their own (with their group leader’s help). However, if you would like, you can call or e-mail the camp office and we can talk it through with you. When can I see my child’s work at camp? For the 4-Week Intensive, we hold an Arts Extravaganza that is dedicated to showing parents, family and friends what Camp Arena Stage is all about. Campers will provide demonstrations and perform and display their work. All are welcome and encouraged to attend. In both sessions, some activities will have a final sharing during the Noontime Shows on the last two days of the session. Many parents plan to attend these Noontime Shows. We announce this schedule in our weekly parent newsletter. Parents are also welcome to visit camp at any time. Many parents like to attend the Noontime Show. Please call the on-site office if you intend to visit and sign-in as a visitor upon your arrival. How qualified is the Camp Arena Stage staff? Very! Most of our instructors are professional artists and educators with expertise in their fields and extensive experience working with young people. Though most of our instructors have completed college, we hire a handful of exceptional undergraduate and graduate students as instructors. The CITs (counselors-in-training), who assist the instructors, are rising high school juniors, seniors, college freshmen or sophomores. All staff members undergo a careful interview process, including background checks and classroom observation. We have done our utmost to hire accomplished artists who, first and foremost, care about and excel in working with young people. We thank you for entrusting your child with us, and his/her safety is our priority. First, in the interest of preventing emergencies, we maintain a high level of supervision: a staff-to-camper ratio of 1 to 5. Each camper has a group leader that they check in with at the beginning and end of the camp day for attendance. This is also the camper’s point person in case of emergency. We have procedures in place for any type of emergency and all staff members are trained in these procedures. If your child is in need of medical attention, staff members are trained in CPR and First Aid. We are also located adjacent to Georgetown University Hospital. Should camp be closed due to unforeseen circumstances or should an emergency arise, parents and guardians will be contacted. A detailed message will also be available by calling 202-600-4064 and on Arena Stage’s website. What is the procedure for regular drop-off and pick-up? Campers may begin to arrive at 8:45 a.m. Immediately upon arrival, a staff member will open your car door and see your camper safely to the Field of Dreams. There, campers will check in with their group leader, a special counselor assigned to a small group of campers, for attendance. Pick-up begins at 3:50 p.m. sharp and must be complete by 4:15 p.m. Campers will only be released to persons authorized by their parent/guardian and cannot leave camp grounds without being signed out. Campers with parent/guardian permission are dismissed at 3:50 to walk off the grounds and catch public transportation. To make drop-off and pick-up less congested, we encourage campers to carpool. Please indicate your interest in forming a carpool on your child’s registration form. What is the cost and procedure for early drop-off/extended day? Due to special diets, allergies, cost and general pickiness, Camp Arena Stage does not provide lunch. Each camper is to bring a well-marked lunch and water bottle to camp each day. That way all campers can eat what they like! Camp Arena Stage will provide a healthy morning snack. My child has severe food allergies. Is Camp Arena Stage peanut-free? Camp Arena Stage is not a peanut-free environment. Please contact us to discuss any food allergies your child may have. Please call us at 202-600-4064 and we can talk about how to make sure your child has the best possible summer at Camp Arena Stage. We are able to make adaptations! We cannot, however, provide one-on-one aides to individual campers. What is Camp Arena Stage's policy on cell phones? Campers are not permitted to have cell phones at camp. They are a distraction and easily lost. We are happy to discuss any extenuating circumstances that would necessitate your child having a cell phone while at camp. During camp hours, you can reach your child by calling the camp office. How can I contact Camp Arena Stage? If you have questions before the start of camp, please call 202-600-4064. Your call will be returned promptly. You can also e-mail us at camp@arenastage.org. What if my child is too old to be a camper? Have the summer of your life at Camp Arena Stage!